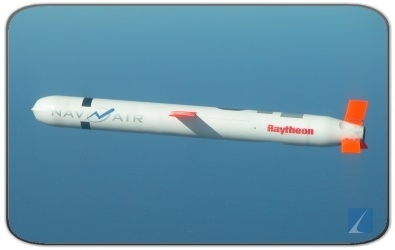 The Tomahawk Land Attack Missile (TLAM) is an all-weather, long-range, subsonic cruise missile manufactured by Raytheon. The missile is launched from U.S. Navy surface ships (RGM variant) and submarines (UGM variant). Tomahawk variants include the UGM-109A Tomahawk (Block II TLAM-A), which was deployed in 1984 and features a W80 nuclear warhead; the RGM/UGM-109C Tomahawk - Conventional (TLAM-C Block III), which was deployed in 1994 and features a 1,000-pound class unitary warhead; the RGM/UGM-109D Tomahawk - Submunition Dispenser (TLAM-D Block III), which was deployed in 1994 and features a conventional munitions dispenser with 166 submunitions in 24 canisters; and the RGM/UGM-109E Tactical Tomahawk aka TACTOM (TLAM-E Block IV), which was deployed in 2004 and features a 1,000-pound class unitary warhead. The variant currently being purchased by the U.S. Department of Defense (DoD) - for the Navy - is the RGM/UGM-109E Tomahawk Block IV aka Tactical Tomahawk features a two-way satellite data link that allows the controller to switch target during flight to pre-programmed alternate targets or redirect it to a new target. The targeting flexibility also includes the capability to loiter over the battlefield, while waiting for a more critical target. The Tactical Tomahawk is sized to fit torpedo tubes and capable of being deployed from a variety of surface ship and submarine platforms. The missile incorporates an active electronically scanned array, millimeter-wave seeker, which provides target acquisition and homing; and a passive electronic surveillance system for long-range acquisition and identification. For guidance, the Tactical Tomahawk uses INS, TERCOM (Terrain Contour Matching), DSMAC (Digital Scene Matching Area Correlation), and GPS. The missile carries a 1,000-pound warhead and is normally launched from attack submarines (such as the SSN 774 Virginia Class) equipped with vertical launch systems (VLS). Production of the Tactical Tomahawk missile began in FY 2002 and the supplier base included more than 300 companies in 24 states. About 2,500 Tomahawk missiles have been used in military campaigns since 1989. As of February 9, 2016, a total of 3,636 Tomahawk missiles have been delivered. The Tomahawk was a great success during Operation Desert Storm in 1991 and the missile has since been used successfully in several other conflicts. In 2014, a U.S. Navy destroyer and a guided missile cruiser launched 47 Tomahawk missiles in a strike on the Islamic State terrorist group in Syria. More recently, in April 2017, Navy destroyers launched 59 Tomahawk missiles at targets on a Syrian air base. On January 14, 2014, Raytheon delivered the 3,000th Block IV missile to the U.S. Navy as part of the ninth year of Block IV Full Rate Production (FRP). 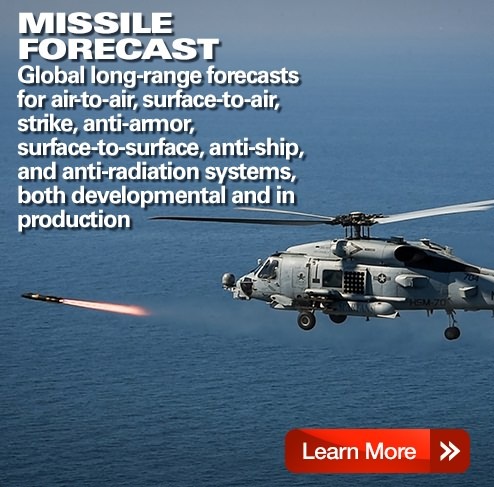 Raytheon has spent $30 million in company-funded R&D on the development of a new multi-mode sensor that improves the missile's ability to identify targets and electronic signals. The new sensor suite, if installed, would be mounted on the nose of the missile. On April 28, 2014, Raytheon successfully completed a test of the new sensor. The U.S. Navy has decided to suspend the purchase of more missiles beginning in FY 2018 - three years earlier than the FY 2014 President's Budget Program of Record, because inventory levels will satisfy munition requirements sooner than expected. The industrial base will be maintained to support unplanned maintenance. Tactical Tomahawk service life is 30 years with a 15 year deployment and recertification cycle. Based on the historic production schedule, recertification will commence in FY 2019. A 15-year Tomahawk production forecast is available through Forecast International's Platinum Forecast System, which includes a breakout of total market unit and value statistics by manufacturer and end-user. This real-time service also includes information on all prime and subcontractors, contract awards, worldwide inventories, a complete program history, and a rationale detailing the outlook of the program. 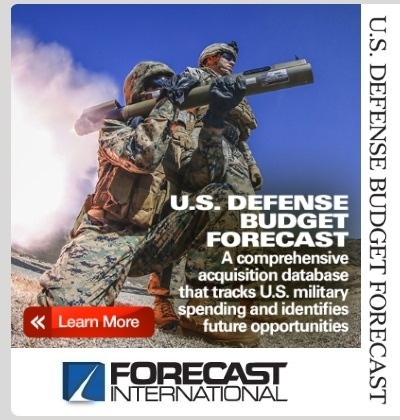 A 10-year Tomahawk production forecast is also available in report format through Forecast International's Missile Forecast service. The mission of the Tomahawk is to provide a long-range cruise missile launched from a variety of platforms to be used against land and sea targets. Sources Used: U.S. Department of Defense (DoD) and Raytheon Company.